Booking now for the 2019 season! Call 603.765.3200 or email birchknollnh@gmail.com! Most weekends and special events require a 2-day minimum! The areas excellent dining and tax free shopping are just minutes away. Laconia and Weirs Beach and all of the surrounding Attractions and Lake Cruises are just minutes away. Other attractions and the White Mountains are just a short drive away. Rated by The Automobile Club, The Mobil Travel Guide, as well as several international travel guides. Click her to view room and rate information. Enjoy the nearby beach, our Heated pool, Game Room, Pool Table, In room phones, Complimentary morning coffee and Friendly staff. Are you planning on staying at our motel? If so then we’d love to have you! We are located off Route 93 North at exit 20. Click here to view printable directions. 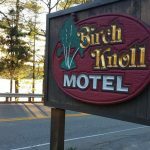 The Birch Knoll Motel is situated in a scenic and picturesque area, on the shores of Lake Winnipesaukee in central NH. Click here to view photos.